Tricked-Out Treehouse | Habitat | Kids VT - small people, big ideas! 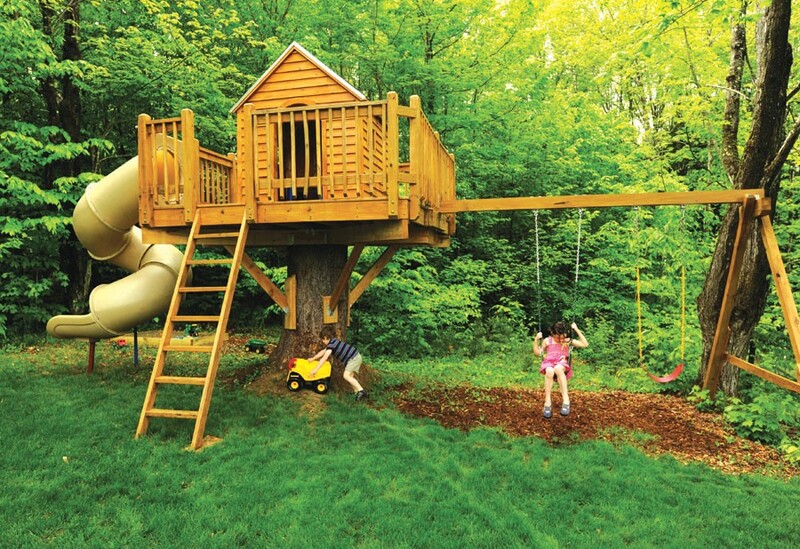 As a kid, Brian Beaudoin used to build forts with his neighborhood friends, but he always wanted a treehouse. So when, as an adult, the civil engineer constructed a tree-mounted hideaway for his two kids in their Middlesex backyard, he admits that "I built it as much for me as I did for them." The wooden structure sits atop a roughly six-foot-high white pine stump. Construction started with taking down the tree — it had been growing, Beaudoin says, "a little too close to our house for comfort." After removing the tree, he had a vision of the fort he could build there. "I had it all in my head to begin with," he says. With a little help from his dad, Beaudoin built the treehouse from pressure-treated pine over half a dozen weekends in 2011. The kids love it, says Beaudoin, but "they're asking for changes and improvements already." His next task? Attaching a door to the front of the house so his daughter can keep her dolls inside. A ladder leads up to a one-room house with a wraparound porch. Beaudoin got the twisty slide for free from an area school; it costs about $4000 brand new. A bar that extends from the porch supports a pair of swings. A bucket on a pulley system lets the kids hoist their treasures up and down.